The content of this topic has been archived on 14 Jul 2017. There are no obvious gaps in this topic, but there may still be some posts missing at the end. I am new in OpenWRT. I have D-Link dir-412, based on Ralink RT3050F chip. So how should I compile OpenWRT to enable USB-adapter? Is it possible to import USB-host support from D-Link SDK? I have a Tenda 3G611R+ that I believe is pretty similar to the D-Link DIR-412. Tenda is an alternate brand for D-Link. Clearly has a RALink 3050 chip on it. Someone on the dd-wrt forums put a serial port on the Tenda 311R, the board has a similar layout. 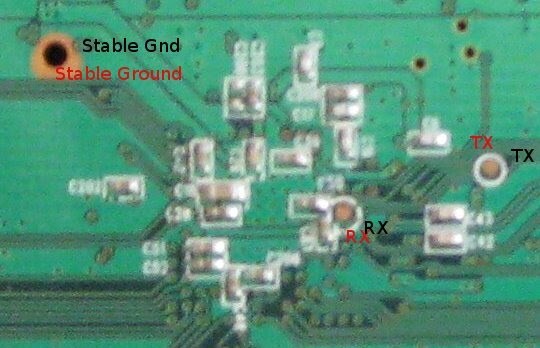 The serial RX and TX are holes near the CPU. Ralink APSoC Ethernet Driver Initilization. v2.00  256 rx/tx descriptors allocated, mtu = 1500! |  ___  \|   __  || kernel reg pid 694 success . httpd Reg gpio hook success . getIfLive: device eth2.1 not found. eth2.1: Setting MAC address to  c8 3a 35 0a 3e 88. VLAN (eth2.1):  Underlying device (eth2) has same MAC, not checking promiscious mode. eth2.2: Setting MAC address to  c8 3a 35 0a 3e 8d. getIfLive: device br0 not found. Router ip address config success. ok, let's talk about serial rs232 port on this router. 1. The pads are difficult. From other users on a different Tenda, I located them. They are on the backside of the router, under the CPU. It is a surface-mount point, not a hole like most routers. Now the TX of the router isn't too bad. You can solder it without too much pain... I'm not good a soldering and I managed it. then put hot glue to hold my wires onto the board to minimize the chance of accidental pulling of the solder off the surface-mount point. The RX of the router is a total difficult pain. It sits very close to some surface-mount components that are easy to damage!! My idea and strategy that I used for now. I tried 10 times to solder the RX without stable results. I could hold a metal probe onto the point and get RX go work, but this isn't very nice. Now I can telnet into the router over Ethernet port! so i can study the router further without having to connect a permanent wire to the tricky RX pad. Just tested Tenda 3G611R+ with the Attitude Adjustment 12.09-beta firmware compiled for Tenda W306R V2.0 . Works perfectly without any glitch or adjust. The hardware is the same. I soldered the pins to use the internal serial for debug/recover if needed. The method of the flash is the option 2 of the U-boot. [    0.360000] JFFS2 version 2.2 (NAND) (SUMMARY) (LZMA) (RTIME) (CMODE_PRIORITY) (c) 2001-2006 Red Hat, Inc.
[    0.520000]   Amd/Fujitsu Extended Query version 1.1. [    0.570000] 0x000000000000-0x000000030000 : "u-boot"
[    0.580000] 0x000000030000-0x000000040000 : "u-boot-env"
[    0.590000] 0x000000040000-0x000000050000 : "factory"
[    0.610000] 0x000000050000-0x000000130000 : "kernel"
[    0.620000] 0x000000130000-0x000000400000 : "rootfs"
[    0.670000] 0x0000002f0000-0x000000400000 : "rootfs_data"
[    0.680000] 0x000000050000-0x000000400000 : "firmware"
[    0.760000] VFS: Mounted root (squashfs filesystem) readonly on device 31:4. [    6.760000] JFFS2 notice: (375) jffs2_build_xattr_subsystem: complete building xattr subsystem, 1 of xdatum (1 unchecked, 0 orphan) and 5 of xref (0 dead, 0 orphan) found. [   12.780000] USB Mass Storage support registered. 1. Quick&dirty - add this call and recompile firmware. 2. Long&wright - difine new board, correct source, compile&check firmware, prepare&post patches to developers. Used the firmware for Edimax 3g-6200n. Wireless and usb works but the switch isn't configured. Need to add this configuration to the file /etc/config/network. And leds&buttons are different: 3g-6200n have 3 leds and 2 buttons, wr306v2 have 3 leds and no buttons. Only EDIMAX_GPIO_LED_POWER = WR306R_V20_LED_SYS = 9.